I know for a fact that if I had to verify them all myself and work out mods etc that we'd be up to about 30 verified layouts on the site so it shows how important ALL the members are in this. So 300 verified layouts, nearly a million hits, over 7000 comments in the discussions and still going strong. Let's go for 400. 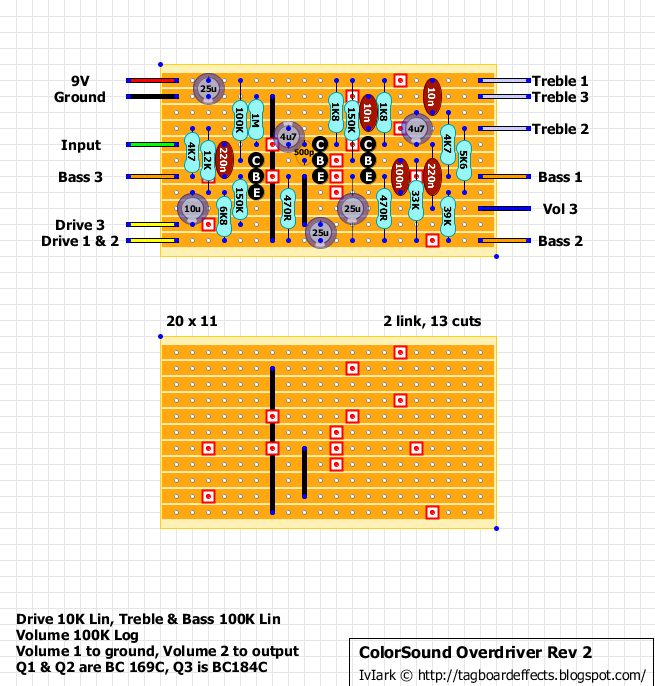 Short but sweet: "FET overdrive developed as a Tube Screamer alternative"
Found a couple of old ones that by the looks of them I did ages ago, but haven't posted yet. May as well get them on here to keep everything together. :o) I haven't mentioned which transistors but they're germanium so just use your favourites. The Fat Control is an on board guitar mid boost/buffer which includes a wide variable gain mid frequency power booster control and a built-in low impedance buffer that has been installed into a steel stomp box. The Fat Control boosts a wide mid frequency range for a more distinct natural musical frequency boost than all other mid controls. The frequencies selected give your guitar the best response and sustain possible. The Rockbox™ Boiling Point™ Overdrive Boost incorporates a 3 position diode selector for a nearly endless variety of harmonic flavor. In the Plexi mode, the pedal has very Marshall-like response. For the Symetrical Overdrive mode, we gave the pedal a truly organic, tube-like distortion, with greater output. You will notice the overtones and response is like no other pedal. The middle position is a clean boost, with more than enough gain to send your favorite tube amp into overdrive heaven. 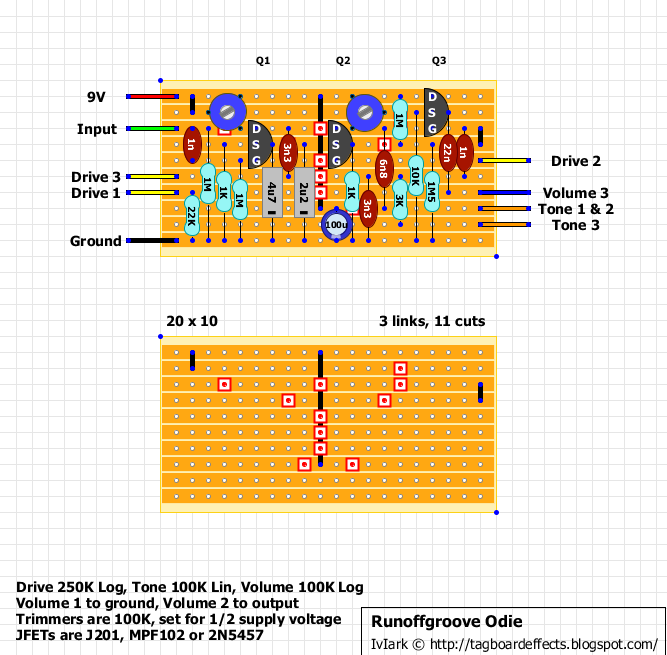 While we gave the Overdrive Boost a tremendous amount of gain, we paid close attention to how the pedal cleans up. 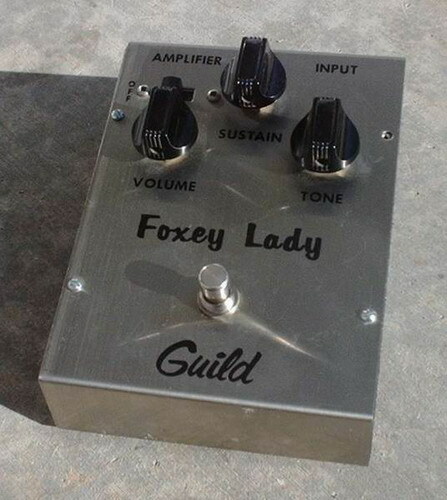 If you are a volume knob player, you will love how this pedal will clean up for a thick, creamy clean rhythm sound. In a recent pedal shootout that included many of the "holy-grail" and vintage pedals like Landgraff, Klon, Fulltone, Lovepedal, Way Huge, Analog Man and Paul Cochrane, the Boiling Point™ was consistently named the "Best of Class" by all the players who participated. For greatest road reliability, we don't use socketed connections in any location with the exception of the 4558 chip, which was designed to be socketed. Socketed connections, which you will find in some boutique builders work, can come loose and fail. We solder all connections within the pedal for greatest road reliability. The IC is socketed so that you can experiment with other IC chips. (We prefer the sound of the RC4558P in most builds, but can ship with any other chip you prefer). It may be quicker to use pin sockets like some of the more expensive competition, but we don't want you to suffer due to unreliable connections. Final assembly of our effects are followed one final test: Each finished pedal is auditioned using the best test we know of - we listen to it. We truly believe that the Boiling Point™ is one of the best overdrive pedals you will ever purchase. If you are an experienced guitarist, satisfied with your amplifier rig, the Boiling Point™ will add a wide variety of very tasty flavors to enhance your sound. "Enhance" is an important concept with us. The Boiling Point™ is specifically tuned with the finest quality components to ensure that the true sound of your guitar shines through. You will notice that your guitar's sound will remain the foundation of that sound even with the most aggressive distortion settings. If you are like most of us, and have wasted money in the past on effects that just didn't cut it, the Boiling Point™ will make a believer out of you. We think that you will find the Boiling Point™ to be a useful tool in your arsenal of sound, and will get a permanent spot on your pedalboard. 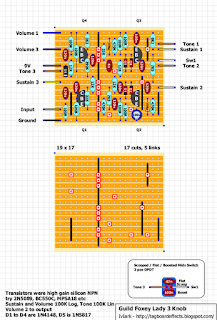 Edited to show the position of the perceived "signal path" carbon comp resistors used by Rockbox, all other resistors are 1% metal film in the original as shown in the layout. 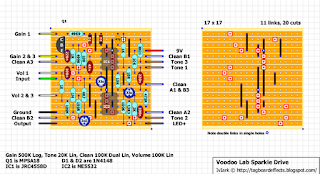 I think they must have found a bulk lot of 1K at a good price, especially as they included the 1K resistor which forms part of the filter and maximum gain resistor attaching to switch 2, which is no more in their apparent "straight line series" signal path than any of the other resistors in there (vref voltage divider accepted). No denying this sounds great in the clips though. The FatPants design began as an alternative to the “pedalized” versions of the input stage of the Echoplex that became popularized a few years ago. Over the course of the two previous versions the design has evolved, and the 2012 version is no exception. 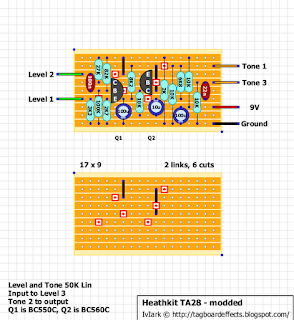 The 2012 version adds a JFET input buffer, a new Body switch for high-gain/full spectrum boost and a re-tooled output section. These changes add versatility and dimensionality to the previous design. The FatPants 2012 is capable of a wide range of boost and overdrive and will serve as a perfect compliment to push your tone into saturation while retaining note clarity and dynamics. Fat – Sets the overall gain of the boost. Lvl – The output volume. Body – Selects between a mid-range and full range boost. In full range mode, it also adds additional gain. You may encounter some scratchiness with the Fat control when the Body switch is off. This is normal. Unfortunately, this cannot be eliminated from the design without altering the overall character of the effect. The Fat control works in concert with the 22n cap to produce frequency-dependent gain. 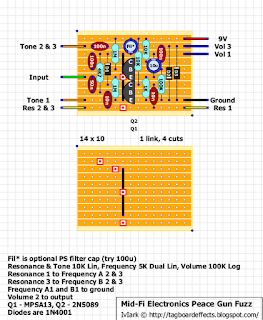 As the control is turned up, it applies increasing gain to the upward filter. This results in increased pick attack and dynamics. When the control is down, the filter is also lowered, but since the overall gain is lowered at the same time it does not “muddy up” the signal. Leave the Body switch off, set the Fat control to max. Adjust T1 until you read approximately 9v on the drain of Q2 with your multimeter. Tweak as desired for maximum gain. I think this will be popular with quite a few people, especially those who want to get the most of their dirt pedals and fine tune the frequency response more effectively. I think this would go to make the perfect distortion pedal if you put your favourite dirt circuit with this in a dual effect box, particularly with an order switcher so you could put the tone control before or after the dirt. The IC is supplied with +/- 9V and I have altered the circuit slightly to use my preferred method of doing this with a ICL7660S to provide the bipolar supply. Note that the original is advertised as being capable of accepting a supply from +/5V to +/-18V. However, the ICL7660S can accept a maximum of only 12V and so I would suggest keeping the supply at 9V if you use the suggested charge pump IC. That still gives you an 18V swing which I expect would be more than adequate for this, but if you would prefer to use an 18V supply for additional headroom then you could use an ICL7662 which is rated for up to 20V although these may be more difficult to find and certainly more expensive. Deflnltlon: Offers flexible control over tone by creating several different response options. Low pass response boosts low frequencies and attenuates high frequencies; high pass response boosts high frequencies, and attenuates low frequencies; bandpass response boosts a specific frequency range; and notch response attenuates a specific frequency. The "state variable" filter is a type of filter used in several synthesizers to control timbre; this circuit is a variation of the state-variable filter that has been optimized for tone control purposes. It offers considerably more sonic flexibility than the tone controls found on most instruments and amplifiers. Modified with additional volume control. 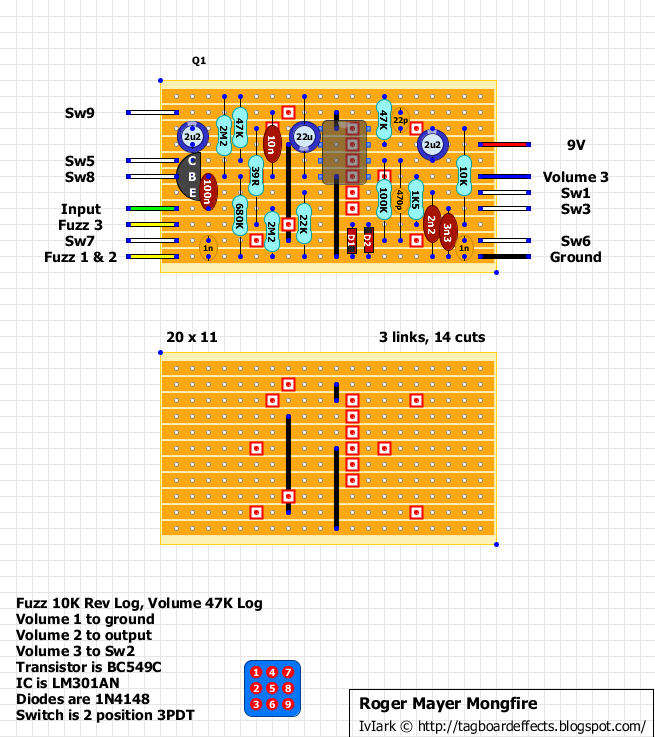 Yay, our 100th fuzz pedal layout! And yes Vince, I know you're going to be annoyed about one of the pots! :o) I left the power supply filter / smoothing cap optional because we know from previous experience that they can change the character of the fuzz and tame things down a bit, so I'd say only use one if you're getting too much unwanted noise. The Peace Gun by Mid-Fi Electronics is an intermodulating fuzz with a sweepable resonant filter. It has the sound of a fuzz with a lot of gain but feels like you're playing with a clean tone which makes for a very dynamic sound. Request. Jeez YA"MF"BM!! But this time with added Depth and Mids controls so at least it offers something a bit different. 1) No standing axial components. EVER! I hate them with a passion. Some people like timmy on here can make standing components look elegant by the effort he puts into the build, but it never turned out that way for me, and most of the time I see them I think they look awkward and haphazard. It's not just the look that makes me want to avoid them though, or the fact they look susceptible to being knocked and bent. 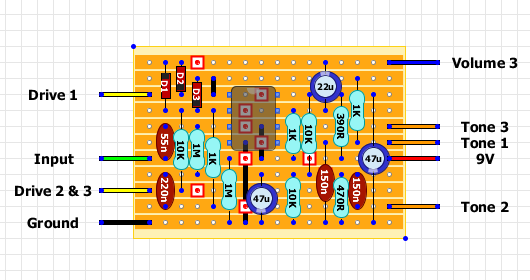 I love to have a board in a vice, stuff all the resistors in one go and then lock them down, turn the board over and solder them all in, and standing components stop that from happening. I'm sure plenty of people disagree with my philosophy here and I've been criticised in the past because my layouts were slightly larger than someone elses (although that isn't always true, there are a lot of layouts on here where mine are the most compact of the ones available), but my OCD has given everyone almost 300 verified layouts to choose from thanks to some wonderful people on here, so those complaining can't moan too much. If they prefer to save a couple of rows in some effects where I have sacrificed compactness for form, then I won't be upset if they use someone elses, and it's not like I can offer them a refund. With the above in mind, I'm not interested in the slightest in reducing a 17 x 9 vero down to 15 x 7. They'll both easily fit in my most commonly used box and so why make something compact that doesn't need to be made compact? 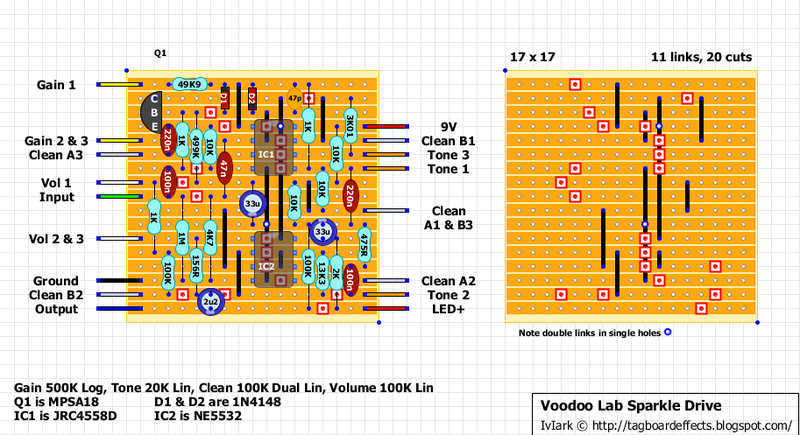 I'd prefer the extra board space to make it easier to build, fault-find and/or mod. 2) Despite point 1, depending on the number of pots and switches I like to keep the board down to a size that would allow it to fit in the most appropriate box. 4 pots and less I want to make sure it can fit in a 1590B, anything more than that (or when it has switches as well which take up just as much room) then I want to make sure it can fit comfortably in a 1590BB. 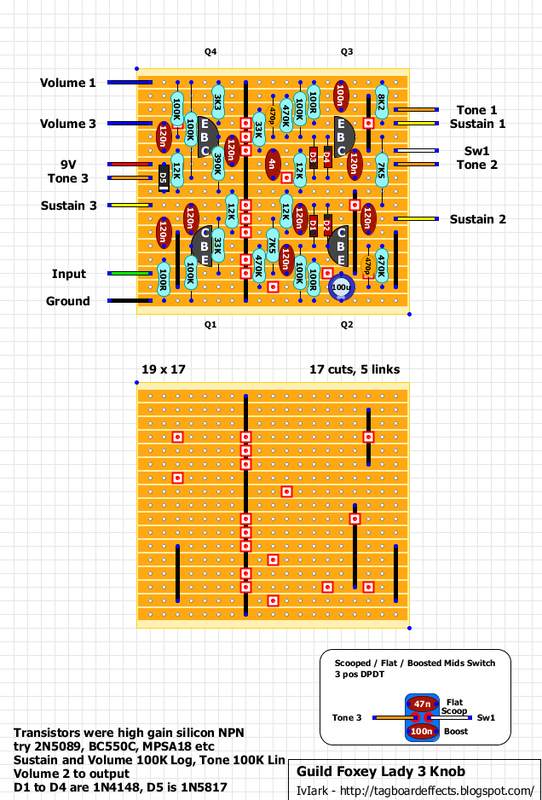 Virtually all of the layouts on this blog (with the exception of some of the earlier tagboard layouts) will fit in a 1590B. So that means the absolute maximum width is 22 vero columns (tight fit and needs filing down at the sides slightly) but most of the time I will aim for an absolute maximum of 21 columns wide and preferably narrower to allow more of a gap for wires. 3) The number of rows doesn't bother me as much. 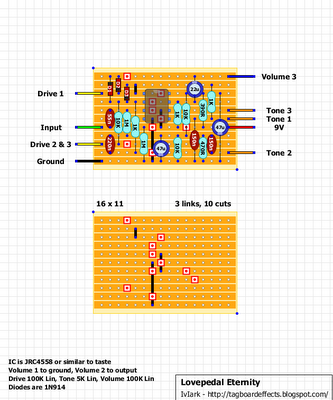 If you're mounting the board on the back of your pots with the components facing upwards then the sockets can limit you, but if you turn the board round and mount it with the components facing downwards as you look in the box then you have much more room, especially if you haven't left space for a battery. You can easily get 22 rows in a 1590B and even more if you're careful about the placing of some components to physically avoid offboard sockets. 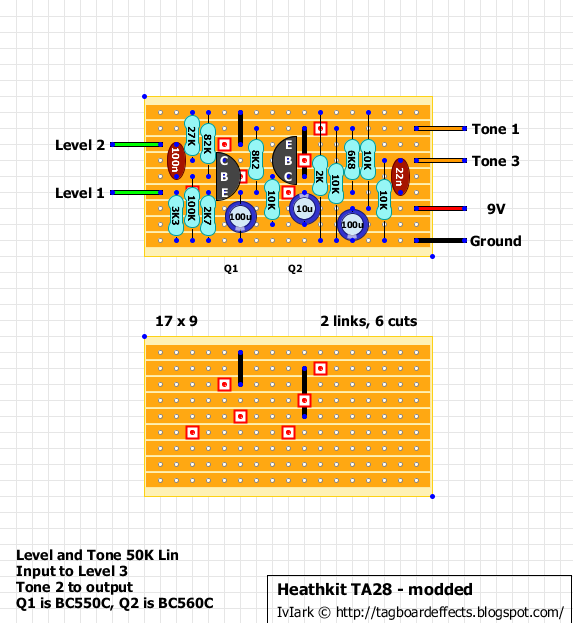 So a Klon may be a struggle (although I bet it could still be done with my layout on here and by a determined builder) but I think everything else around 24 rows should fit in no problem. There are other things but I don't want to write 'War and Peace' about it, so I'll leave it with the most important three criteria to me. 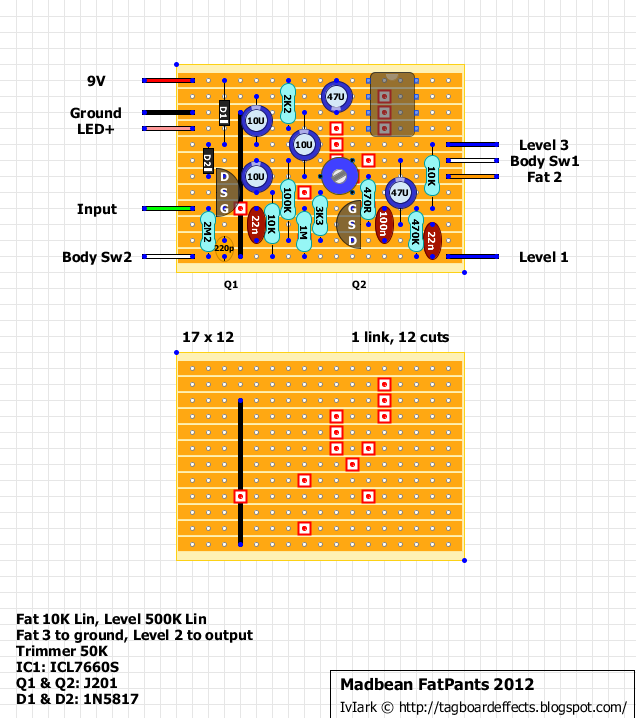 I didn't want to choose a small circuit like a Super Hard-on for this because it's too simple and wouldn't give me enough of an opportunity to explain why I do certain things. But likewise I didn't want to choose something too big where people would lose the will to live before we got to the end. So I thought a good example for something like this would be something like the Lovepedal Eternity. Firstly I look at the schematic and see if I can estimate the final width to determine how many columns and rows I'm going to need. 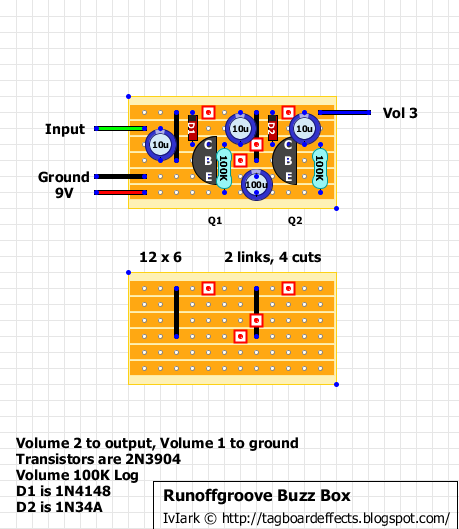 With some effects like the Big Muffs there is a long row of cascading stages and so I know with something like that I'm going to have to do it in two levels to keep it 1590B friendly, left to right at the bottom for the first half of the circuit, and then right to left at the top to finish off the second half. 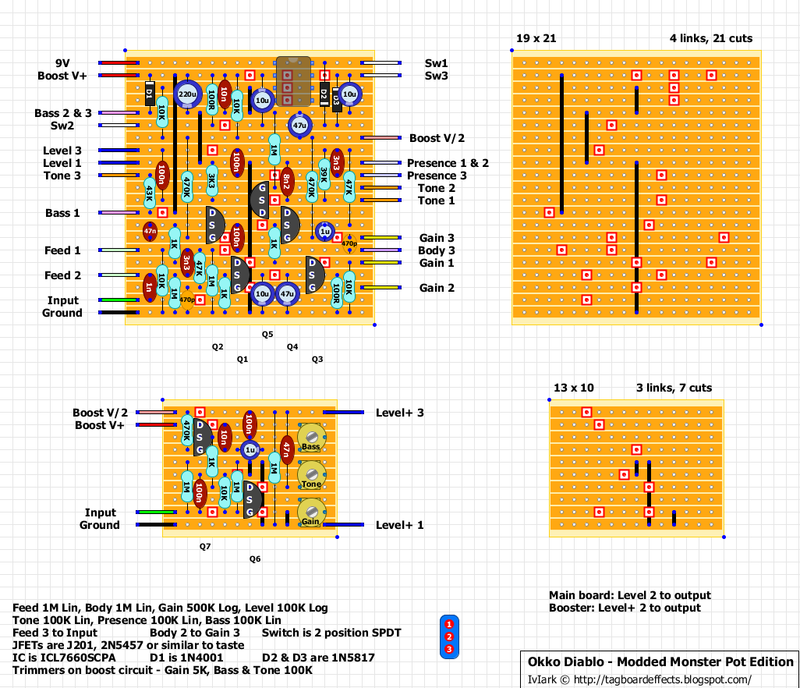 With the Eternity though there are no buffers and the circuit is fairly simple so I know that it will easily fit on a board with 21 columns or less meaning I can do this simply enough on a single level run from left to right. With it being an IC circuit I tend to estimate 11 or 12 rows depending how many additional components I'm going to have to add, so here I have a board starting off at 16 columns by 11 rows to start off with, and place the IC in an appropriate place. 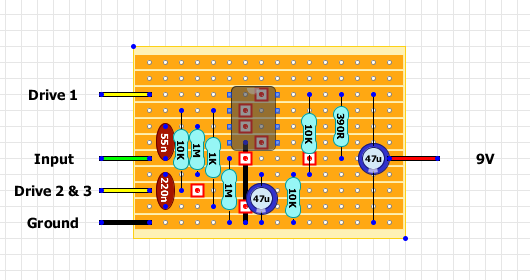 I always use the bottom row as a ground rail so it is easily available to take components to ground from anywhere on the board, and so put a link in from the bottom row up to IC pin 4 to make the required ground connection to the opamp. Next I put in the components required for the power side of things. There is a 390R resistor in series with the supply and so I put that in up to pin 8 of the IC so make the V+ connection. From V+ there is a 47uF capacitor to ground to filter out noise from the power supply and smooth ripple, I have put in a radial capacitor here but would probably actually use an axial capacitor myself for this because there are much better suited to this sort of span of rows than the radial caps are. There is a 10K resistor from V+ to Vref (half supply voltage), and from there another 10K goes to ground to finish off the voltage divider. 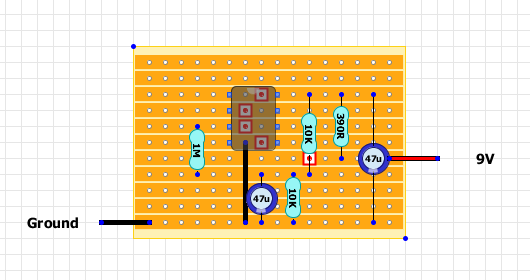 In line with my philosophy, I always choose the location of the Vref row so that a resistor can lie flat to V+, and flat to ground. The voltage on that row would now measure 4.5V as required. 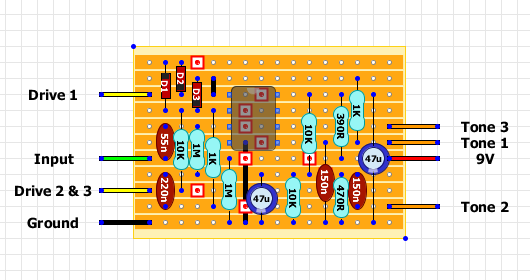 Another 47uF filter cap to ground from this row and then a link up to IC pin 3 via a 1M resistor and that is the power side of things finished with. 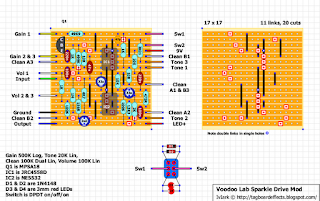 So this shows the supply rows as the layout currently stands, black is ground, red is V+ and pink is the Vref 4.5V row. 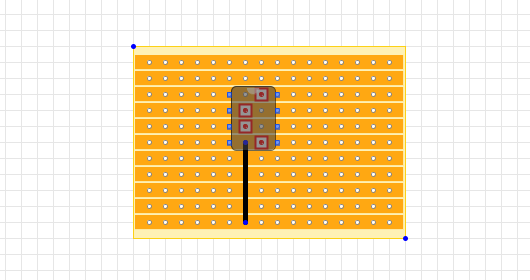 Incidentally, that ground rail from pin 4 of the IC comes in really handy sometimes if you want to ground components from one of the rows above the IC without having to go all the way down to the bottom row. You'll see that done on a few of these layouts. 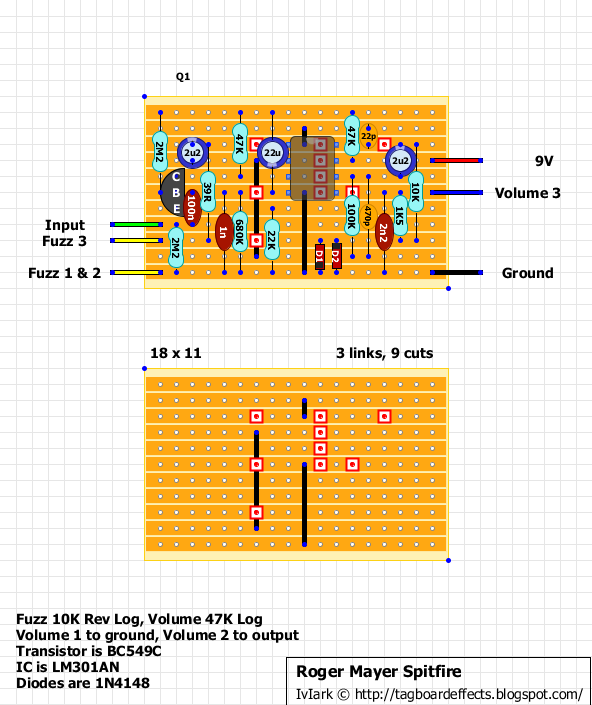 I always start the signal path on the left and finish on the right, then the input and output wires are the correct side of the board when the vero is mounted on the back of the pots in the conventional way with the components facing up. 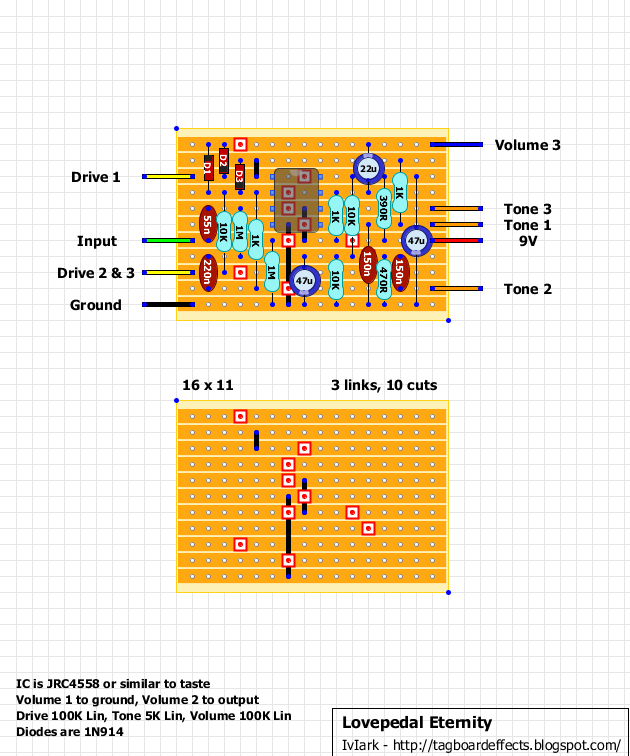 So from the input we have a 1M pulldown resistor to ground and a 55nF cap up to the non-inverting input (pin 3) of the IC (you'll notice I've changed the numbering from the schematic so I've swapped pins 1 to 3 around with pins 5 to 7 which allows me to run the circuit from left to right as I prefer. 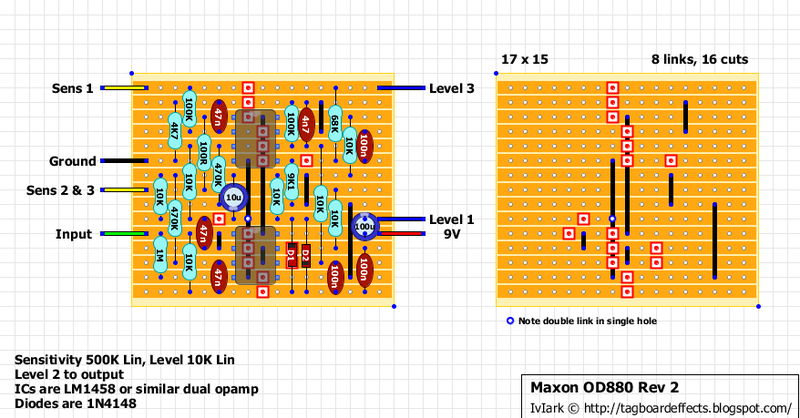 This is a dual opamp and there's no issue with using the left hand channel first or vice versa). 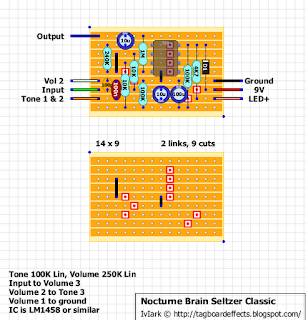 I use Panasonic or polyester box caps most of the time which have a 5mm pitch, so ideally I want a 3 row span from the capacitor. 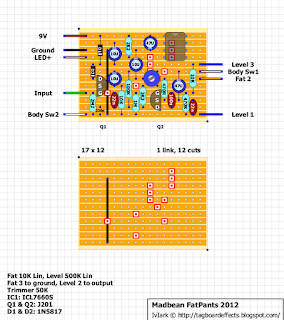 I place the cap accordingly and under the IC I put in the 1M pulldown resistor. 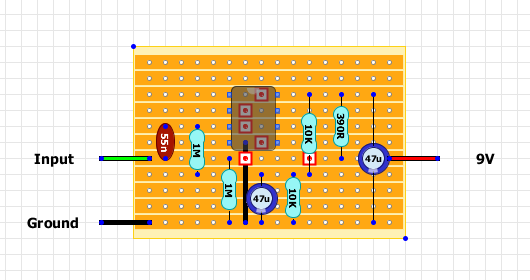 I put that in position under the IC basically because it will go there and so not interfere with any components that I need to place on the left side of the board. Putting a cut after the top of the 1M means I have 3 holes further up the same row which I can use later if I need to. 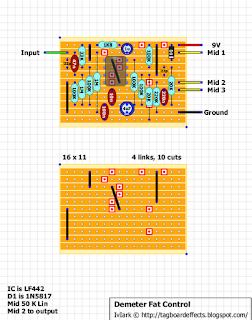 Remember that just because the schematic shows the 1M first, it doesn't mean you have to put it closest to the input wire on the board. This is electricity which moves pretty fast and so you can make the connection anywhere on the row and it will perform its intended function perfectly well. From the inverting input (pin 2) there is a high pass filter to cut some bass before the gain stage so things don't get flubby. This is a 1K resistor followed by a 220n cap to the Vref row, and because I'm using 5mm pitch caps (and want to stick to a 3 row span where possible) I need to place the bottom of the 1K resistor 2 rows away from Vref. So they go in the only place that can meet that criteria as shown, with a cut again put to the right hand side of the series connection so I can use the same row further down for something else. Next there is a 10K resistor that goes between the inverting input (pin 2) and lugs 2 and 3 on the drive pot, so this goes in an appropriate place with the usual added cut. This resistor sets the minimum gain available from the Drive pot in its far counter clockwise rotation, so if you want more gain in the lowest setting increase it, if you want less gain decrease it. Lug 1 of the pot connects to the output of the first opamp channel (pin 1) and so I can add the connections for the Drive pot. I now add the asymmetrical clipping diodes. D1 and D2 make a series pair which go in the feedback loop between pins 1 and 2 so those connections are easy enough to make using the top row as the series junction, again with a cut to isolate it from the rest of the row. 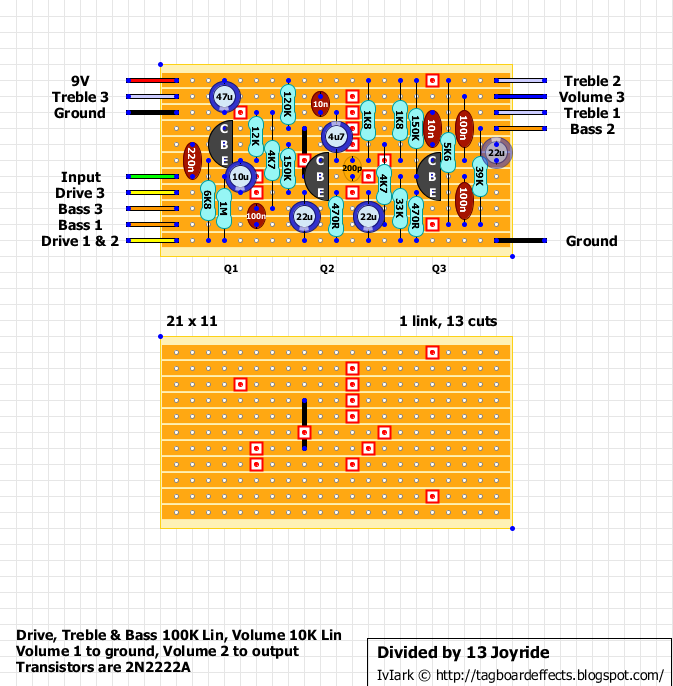 D3 however needs to go between 1 and 2 on its own which would mean having a standing component. 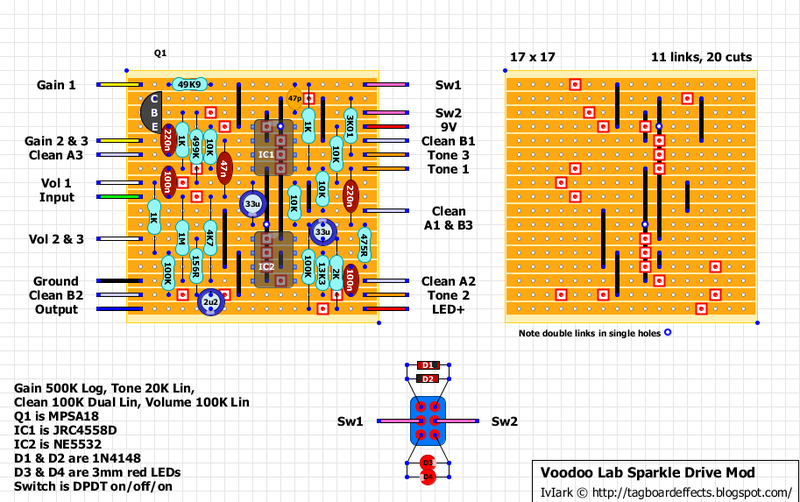 No thank you, so I add a small link between pin 1 and the row above so I can keep the diode lying flat. This gives me an added advantage which I will come to in the next section. 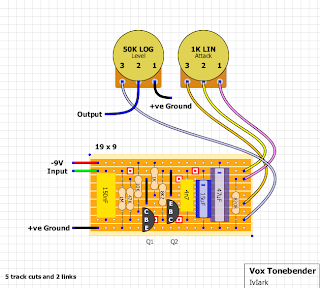 The schematic shows a 1K resistor between the output of the first opamp channel, and the non-inverting input of the second. 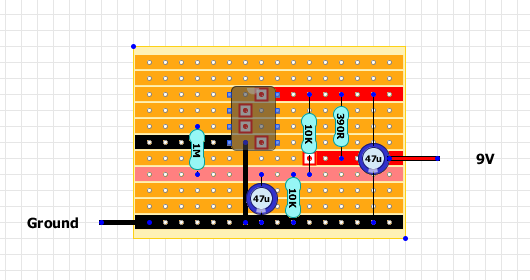 This causes an issue because they are on opposite sides of the board and so I can't use a single component to make this connection unless I mount the resistor over the top of the IC. But that little link that I used for D3 has given me exactly what I need, a connection to pin 1 from the right hand side of the board, so I can just take a 1K resistor from the second row down to non-inverting input (pin 5) and that connection is made followed by a 150nF capacitor to ground (again this shows a 5mm pitch Panasonic type cap but they have long leads so there's no problem spanning multiple rows using them, or you could use an axial cap of some sort if you prefer). When I use links they often have two functions like this which actually goes to make things easier in the long run. The 1K resistor followed by the 150n cap to ground is a passive low pass filter to cut some high end after the gain stage. It starts attenuating at 1061hz, and so all frequencies below that are allowed to pass, frequencies higher are rolled off at 6dB per octave, meaning the signal amplitude is reduced by half every time the frequency doubles. You can see that the outer lugs of the Tone control are connected to the inverting and non-inverting inputs of the right hand channel and so I place those wires in the layout. 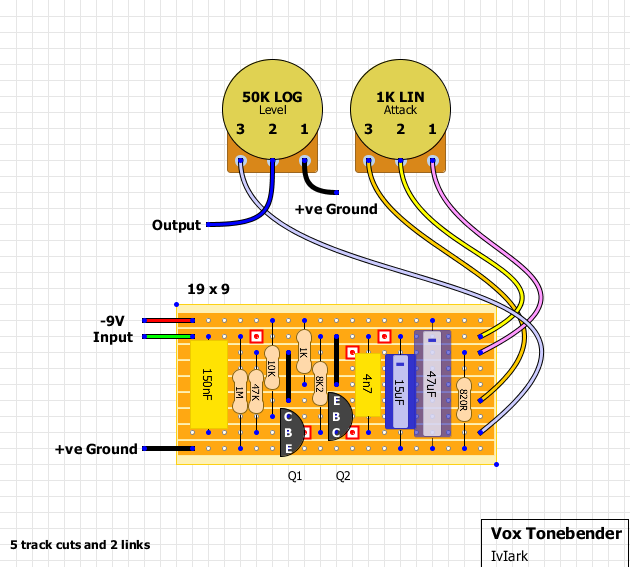 Lug 2 of the Tone control connects to a 150nF capacitor and then a 470R resistor to ground, and as I have no need to continue the Vref row, I can place them as shown and put a cut between the top of the 470R and bottom of the 10K (obscured by the 150nF cap between them). 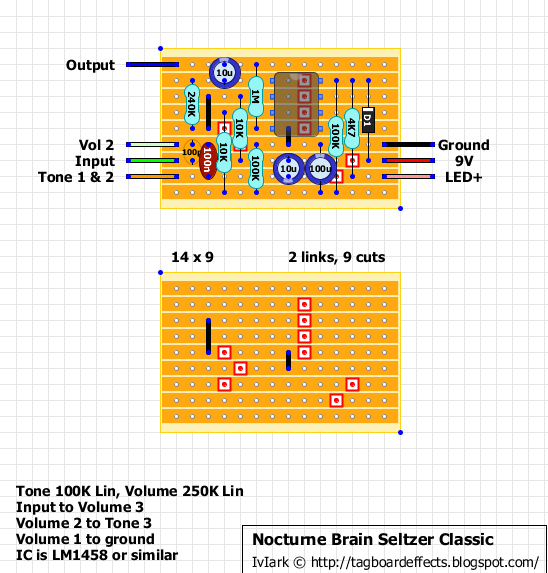 The 150n and 470R combination to ground attached to Tone 2 creates a 2.2kHz RC network and rotating the tone pot to the extremes either "attaches" it to the inverting or non-inverting input. When at the non-inverting input (pin 5) frequencies above 2.2kHz are dumped to ground and so some high end is rolled off. When at the inverting input (pin 6) feedback frequencies above 2.2kHz are dumped to ground giving a treble boost by countering the roll off created by the 1K/150n low pass filter at pin 5. Nearly finished now, you can see that a 1K resistor is required between the right hand channel inverting input and output (pins 6 and 7). 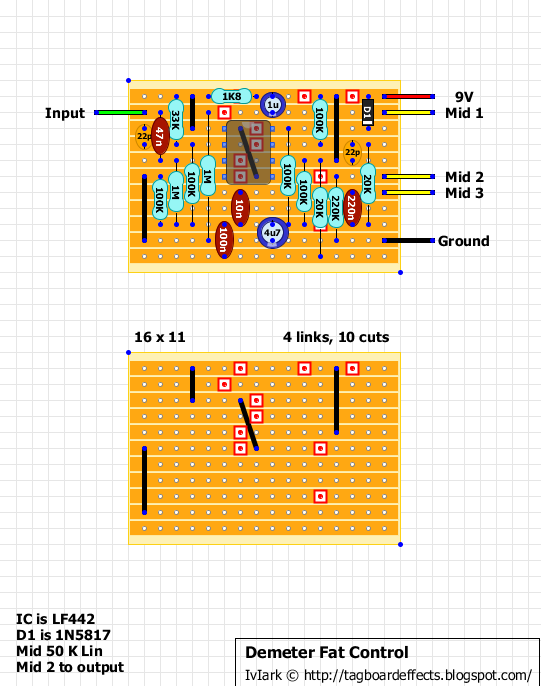 Again this would require a standing resistor and so I can make use of those 3 free holes mentioned earlier and put the 1K from 7 with a link up to 6. 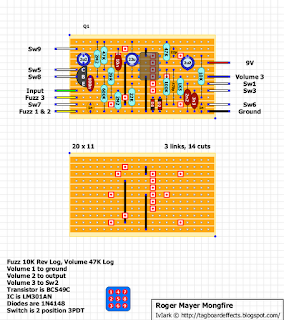 The only thing left is the output capacitor, so I can take that from pin 7 up to the top row making sure the negative leg is to the top, and then add the wire connection for Volume 3 lug to the right hand side of the row. And that's your layout finished. 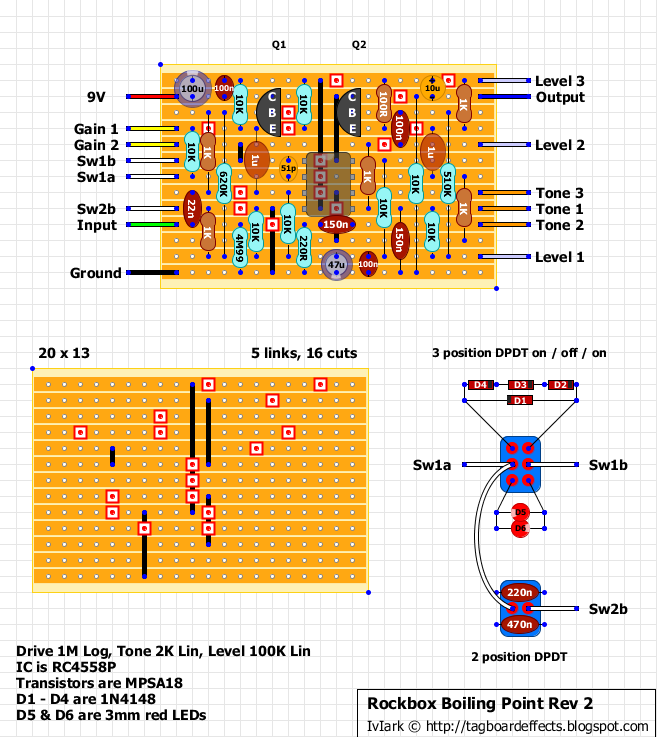 Just add any notes required about the components or additional connections, remove any unrequired cuts if you want to (the Drive 2 & 3 cut isn't needed but I just left it anyway), and you are done. 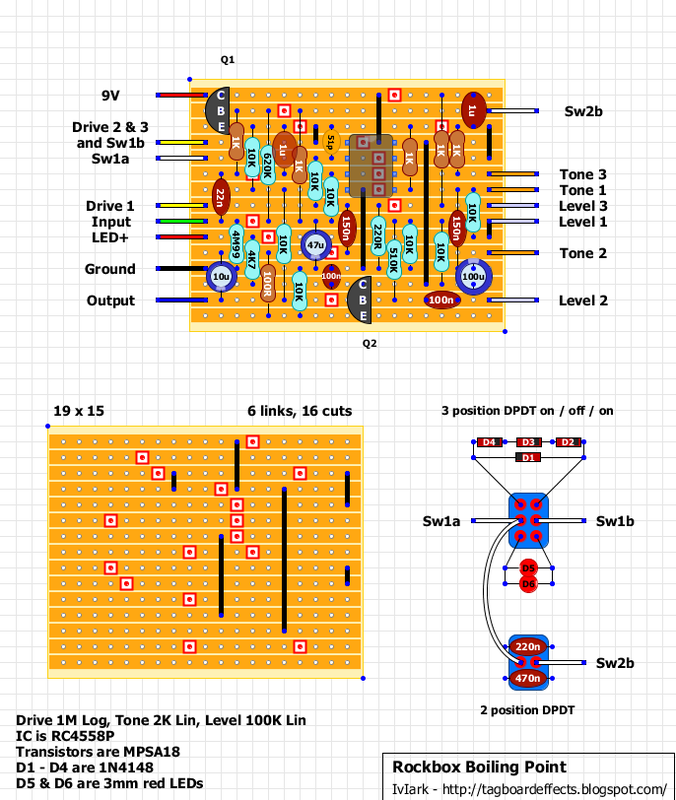 I may add additional layout guides in the future to show other things that haven't been covered with this layout, such as the Big Muffs or some of the popular JFET effects to show how I tend to deal with transistor circuits. If you have something that you think would be useful to cover in this kind of guide then let me know and I can get a consensus of what people want to see. 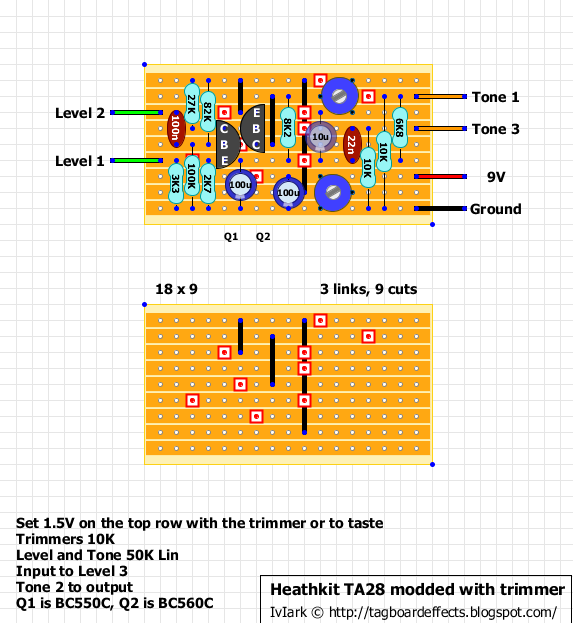 I don't know exactly what the official "Mod" version is, but this offers a 3 position switch to choose between stock setting with the 1N4148's, a more compressed setting with the LEDs (or try germanium diodes if you prefer), or the centre off position to give you a clean boost "diode lift". The Roger Mayer Spitfire is the latest fuzz guitar effect in the Rocket Series and has been deliberately designed to produce the classic triode tube type distortion that is particularly rich in harmonics that are very musical and pleasing to the ears. 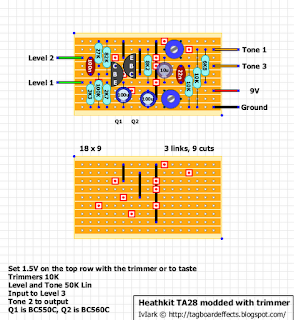 This basically means that chords can be used at high levels of distortion without sounding raucous or just plain nasty, as would be the case with other types of fuzz boxes. The Spitfire maintains the guitar's original tone characteristics with the open sound, detail and sonic heritage that have their roots in my association with the making of Jimi's recordings. I have added a few new design twists and coupled with my extensive knowledge from the retro fuzz and distortion boxes we already produce have come up with a new sounding modern distortion/ fuzz sound that does indeed sound fresh and distinctive and not just another boring reissue or clone of a 30 year old design. It has definite advantages that will appeal to those players who strive for a modern sound with strong roots in the past. The Spitfire is a very Low Noise analogue high gain design, stable, free from radio and other electronic interference that cause so much trouble. 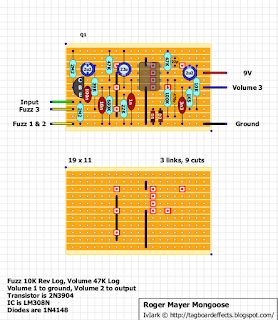 It has a greatly increased output level that enables it to overdrive the front end of any amp very hard. Turning up the Gain or Drive control will produce feedback at very low sound levels and a virtually never ending sustain that is very full and tight with the top end staying sweet encouraging soaring string bends and wild solos. The overall EQ has been carefully developed to produce a well-rounded fatness and musical tone, not the nasal or fizzy thin type of fuzz sound that is common with digital modellers, multi effects etc. Analogue circuitry really does sound better when it comes to high gain low noise situations; there is no contest. The unit really comes into it's own during live performance situations as it cleans up superbly well using the guitar volume control whilst maintaining the guitar's original tone as the signal goes from wild distortion to the original guitar tone. This effective control from the guitar makes life a great deal easier for the live player who likes to change tone effortlessly from his axe. The Spitfire even when used at high gain levels maintains a very clean transition from note to note that is transparent and free from the usual nasty type of spitting sounds heard so often when the signal decays and a new note begins. This of courses encourages fast solos with lots of sustain that actually sound louder due to the fact that the spaces between the note are not filled up with mush and noise. 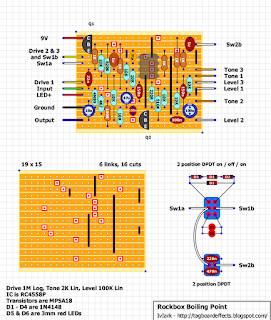 The circuit senses and uses electronic information fed directly from the guitar's pickups to control it's own operational parameters and it is recommended to use the Spitfire 1st in the signal processing chain to take full advantage of this internal feedforward feature. It is this particular feature of the Spitfire that that helps to make it quite different from early fuzz pedals and makes the unit respond very well to each individual players touch, style and playing technique. Five minutes playing with the Spitfire will convince anyone this is not just a re-hashed design but genuinely innovative with some new tone colours. The unit comes in the very rugged Rocket housing and features Hard Wire Bypass and an attractive and striking Signal Red paint finish. It has two controls: Output Level, Drive or Gain and is powered by an internal 9 Volt battery with an operational life of over 150Hrs so changing a battery should not be a problem. An external power supply (not supplied) can be used. Successful operation is simple and is probably our easiest box to use with no previous knowledge or study of a manual required. The MONGOOSE FUZZ was developed in 1985 for guitarists who demand a guitar effect with lots of fat fuzz and enough bottom end to keep a metalhead happy. 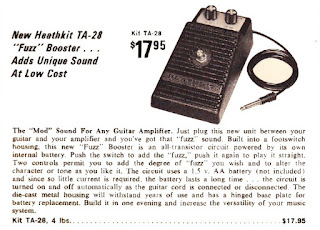 The MONGOOSE FUZZ also sounds as if it has a pre-set type wah voice that gives the distortion distinctive focus. It has proved popular with a wide and varied type of guitar player from Metal through Rock and Jazz. It is more modern sounding and civilised sounding than the Axis or Classic Fuzz and has found a niche with those who want an alternative but not too radically different sound that the current range of mass produced units from the USA, Japan and Far East produce. Electronically the Mongooose uses a combination of both discrete and IC analogue design techniques. 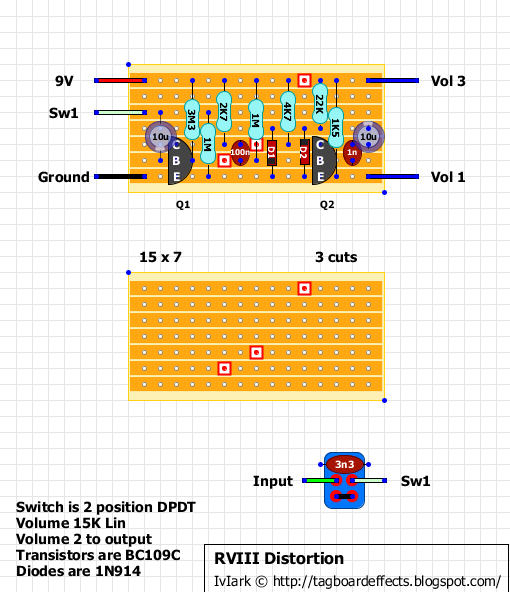 The clipping circuit primarily comes from a passive diode circuit resulting in smooth compression and harmonic overtones providing a smooth and transparent transition from clean to overload states. Chords sound very good and with the amazing amount of sustain available, feedback is possible at the lowest amplifier volume settings. These features have made the Mongoose popular in the recording studio and similar situations where feedback is desirable at low sound levels. Current users include Bono (U2) and Joe Perry (Aerosmith). Another application of the Bazz Fuss design is the Buzz Box, also designed by Christian. The circuit is simply two BF in series, but the second BF stage uses a germanium diode rather than the usual silicon. The circuit produces a nasty (in a good way), explosive octave-up fuzz similar to the Scrambler and Green Ringer. Like the Dyna-Ranger, the Joyride is a highly-adjustable, 3 discreet transistor, warm, organic, and very amp-like sounding overdrive pedal that offers everything from a subtle bump-up with hair, to punishing, highly-boosted over-the-top overdrive. 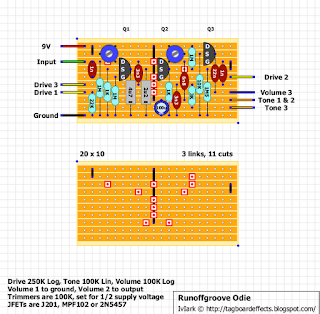 With Volume, Treble, Bass and "Drive" controls, it is very flexible. Note: There was an unnecessary 22u cap in the last layout above Q1, so if you've built this with the old layout snip that cap out. 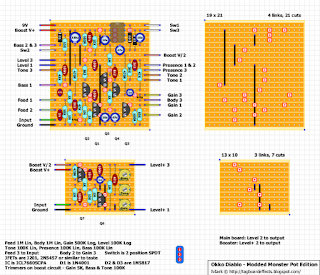 If you're building this now, make sure you're using the latest layout with just one 47u cap above Q1.